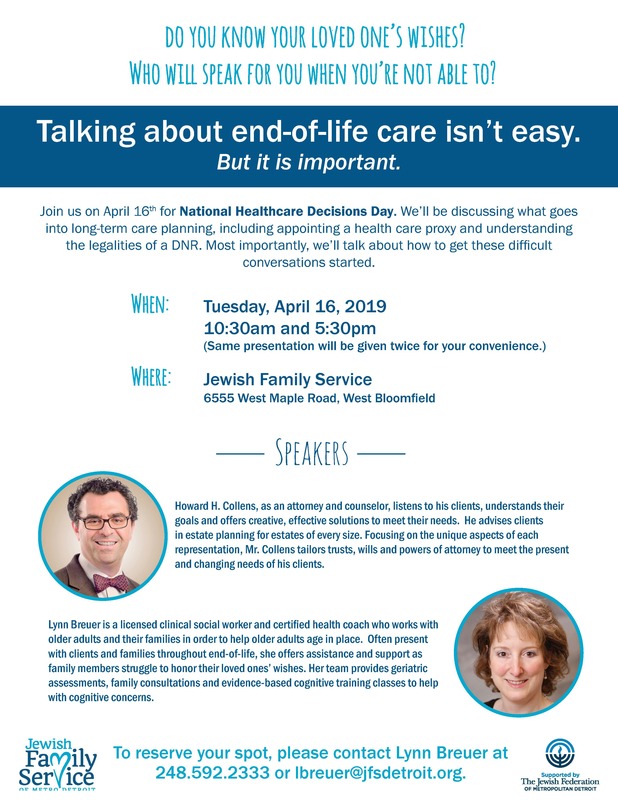 Join JFS on April 16 for National Healthcare Decisions Day. We’ll be discussing what goes into long-term care planning, including appointing a health care proxy and understanding the legalities of a DNR. Most importantly, we’ll talk about how to get these difficult conversations started. Attorney Howard H. Collens offers create, effective solutions to meet the needs of his clients. He advises clients in estate planning for estates of every size. Focusing on the unique aspects of each representation, he tailors trusts, wills and powers of attorney to meet the present and changing needs of his clients. Licensed clinical social worker Lynn Breuer works with older adults and their families, offering assistance and support to help older adults age in place and to help family members honor their loved ones’ wishes. Her team provides geriatric assessments, family consultations and evidence-based cognitive training classes to help with cognitive concerns. To reserve your spot, contact Lynn Breuer at 248.592.2333 or lbreuer@jfsdetroit.org.